NETWORK UPDATE: The DEMOCRATIC PRESIDENTIAL DEBATE adjusted up 0.2 to 1.7 in finals, while 48 HOURS lost 0.1. ABC’s COLLEGE FOOTBALL game rose 0.2 to 1.9, while FOX’s stayed put at 0.5. CABLE HIGHLIGHTS: With one exception, Saturday cable was again the land of COLLEGE FOOTBALL and anime. 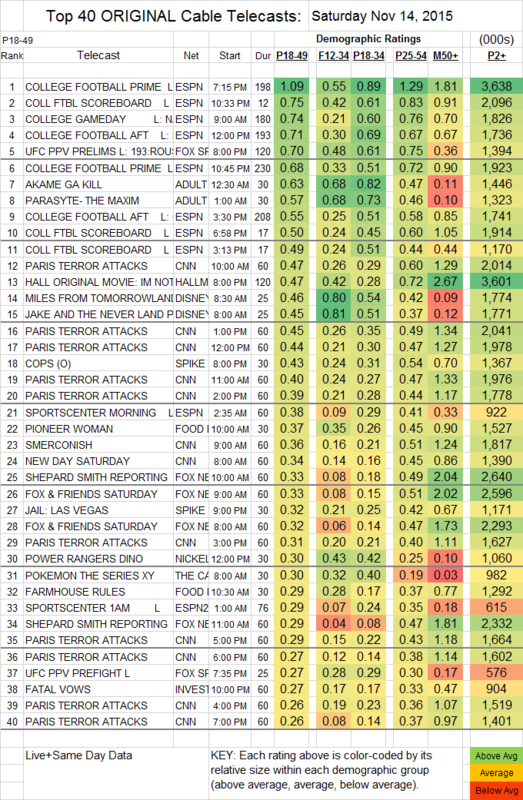 ESPN owned 8 of the day’s Top 100 slots with games and associated programming, led by the primetime game at 1.09. Fox Sports 1 interrupted the flow of football with its UFC PRELIMS to the Ronda Rousey fight (which was pay-per-view) at 0.70. On Adult Swim, DRAGON BALL Z was steady at 0.81, with 1.75M total viewers. AKAME GA KILL lost 0.06 to 0.63, PARASYTE held at 0.57, MICHIKO & HATCHINI was down a tick to 0.52/1.21M, NARUTO dropped 0.07 to 0.46/1.03M, ONE PIECE fell 0.07 to 0.40/923K, and KILL LA KILL remained at 0.40, but with 921K total viewers. Notwithstanding its title, Hallmark remained in the holiday spirit with the original movie I’M NOT READY FOR CHRISTMAS at 0.47. On Food Network, PIONEER WOMAN was down 0.03 to 0.37, and FARMHOUSE RULES fell 0.04 to 0.29. On BBCAmerica, DOCTOR WHO had a 0.11 drop to 0.24, but THE LAST KINGDOM gained 0.04 to 0.09/310K. On Starz, ASH VS EVIL DEAD rose 0.04 to 0.16, but DAVINCI’S DEMONS fell 0.03 to 0.04/231K. Sundance’s THE RETURNED was up 0.02 to 0.04/127K. Esquire entered the scripted game with SPOTLESS, a British import that premiered at 0.03/68K.